The state of California is backing off from relying solely on test scores to evaluate teachers and schools. They are putting a one year delay on the use of a new test being rolled out this year, preferring to wait for “at least two years of results to judge school progress,” and will “shift from a school quality measure based solely on exam results to one that would include other factors.” Fully story from Daily Kos. Ever wonder how it’s possible that some teachers come out in support of the “reform” movement? Maybe, like some teachers in New Mexico and Florida, they’re being paid or offered gift cards for writing blogs or posting comments on blogs that are favorable to the anti-public school movement. Is Pearson "spying" on our children? Education blogs and social media sites are on fire this morning over reports that Pearson is spying on children via their social media posts. Here’s a quick summary and some thoughts. A school superintendent in New Jersey reported that her district had been contacted by Pearson about a breach of test security. According to the test company, a student had posted a picture of a test question on Twitter. In actuality, the student had posted a comment about the test hours after the test was over. The story was reported by Bob Braun of the Star Ledger, who discovered that Pearson became aware of the alleged incident through a service which they use to monitor social media. 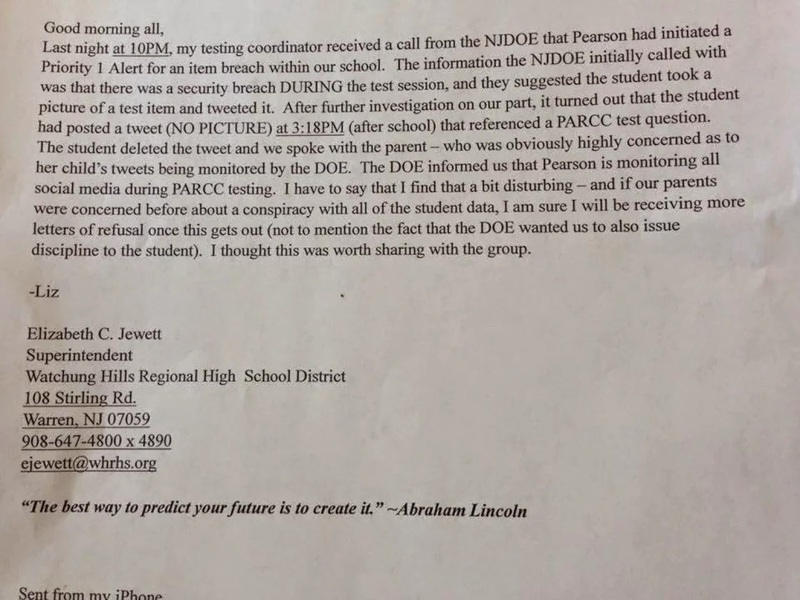 Pearson’s response is essentially that monitoring public postings on social media is necessary to insure secure tests. You can read more about this story at BobBraunLedger, The Washington Post, and DailyKos. Pearson isn’t acknowledging any wrongdoing. But it’s interesting to note that until this morning, Tracx, the company that does the monitoring for them had a page on their website using Pearson as a case study for their service. As soon as the story exploded, they took the page down. Unfortunately for them, Google caches website pages, so you can still view it here. (note to anyone thinking about hiring Tracx, these guys don’t seem to know how the internet works). What’s most disturbing about this isn’t just the spying / monitoring, it’s the fact that this whole story broke based on a FALSE ACCUSATION. Remember, Pearson claimed that there was a photograph of a test item taken during a test, but no such picture existed. That is not a simple mix-up, it is a HUGE distinction. And this is the company that will be controlling all the data that will be used to determine who passes and who fails – who gets fired and who gets to keep their job. Finally, if nothing else, this is just another reminder about the use of social media and posting things on the web. Things posted on Facebook, Instagram, etc, are only private if you make them private – and even then they’re only as secure as your worst frenemy. Some of the following links are, once again, pretty depressing, so we’ve made sure this post closes with some positive news. Fortunately Dr. Cohen is not the only local superintendent railing against the reform agenda. Along with Dr. Rella of Comsewogue and Michael Hynes of Pat-Med, David Gamberg of Southold has been very vocal. Here’s an excellent, short, piece from School Leadership in which he articulates how foolish it is to evaluate teachers by test scores (esp. art, music, PE. etc). Here’s another petition that’s just been started up calling out the Governor for attempting to destroy our schools. Thanks to Greg Schmit who teaches Social Studies at the Middle School. The question came up in one of the meetings about why NYSUT doesn’t advertise more, and the basic answer was money. To address this, NYSUT is looking for contributions to fund their “Call Out Cuomo” campaign. Click here to contribute. Also in last week’s meetings, we made reference to the money the state took away from schools through the GEA. The state has also failed to deliver funds that were owed through the Campaign for Fiscal Equity Lawsuit. SWR is currently owed $5.1 million by New York State. Click here to see how much other districts have been shorted. It seems that the incessant vilification of teachers and the steady erosion of our rights, autonomy, and job security are taking their toll. In a story that should be a shock to NO ONE, NPR reports that enrollment in teacher training programs is down dramatically (53% in California, and, while no numbers are given in the report, New York’s numbers are way down). In late 2013 we conducted a member survey on the Common Core and 90% of SWRTA members expressed dissatisfaction with them (about half of those members felt they should be revised, 1/4 thought they should be scrapped, and 1/4 thought we should just work through the problems). The NEA posted a piece calling for keeping the CCSS, but with a “course correction.” We aren’t going to do another survey, but we’re curious how many teachers have had a shift in their opinions in the last 18 months. Please feel free to email us your feelings on the topic. (Thank you to Linda Blasko for the link). Over the past few weeks, there have been rallies and forums all over the state, including not just teachers, but lots of parents as well. Attendance has been impressive, and many more are planned. Early this week over a thousand educators filled the steps of the Capital. Locally, we have been getting incredibly positive feedback from members, many of whom wrote letters or made phone calls for the very first time (and found, as promised, that it was really not at all painful). We’re getting more questions like “what else can I do?” than every before. Under the philosophy of “know thy enemy,” here are a whole assortment of stories and links related to Governor Cuomo. In full view of everyone, the Governor’s office, which is a potential target of a Federal investigation related to the shutdown of the Moreland Commission and other possible wrongdoing, announced a new policy whereby all emails will be deleted after 90 days. They claim it is to facilitate a new email system, but EVERYONE KNOWS THIS IS BS. The Microsoft system the Governor’s office uses can store thirty years worth of email. Nonetheless, they’re going forward. Does the email deletion constitute and obstruction of justice? We’ll never know, as the evidence will have long been destroyed before the Feds get close enough to ask the question. Andrew Cuomo wrote a book. Nothing big about that – politicians write books all the time. What’s notable though, is that Cuomo will get more than $700,000 for this book, which so far has sold 3,000 copies and isn’t exactly on the upswing. If you’re wondering how a publisher could be so foolish as to set themselves up to lose more than a half-million dollars on a book deal, consider that “the Cuomo administration was lobbied both before and after … the book contract by the owner of HarperCollins, News Corporation, and News Corp received tens of millions in tax breaks as a result of that lobbying.” Read more at the Perdido Street School Blog. Sign this petition to tell the Governor that his failure to fund NYC schools is a violation of students’ civil rights. The East Hampton Star gives Cuomo a bad grade.